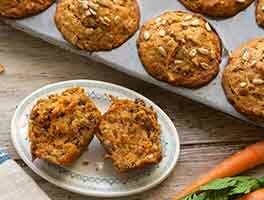 These muffins will brighten up any morning with their zesty lemon flavor and crunch of poppy seeds. 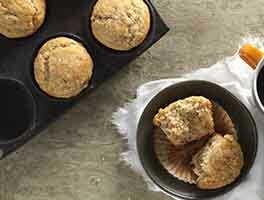 Although yummy without the glaze, you'll be amazed at how a simple sugar-lemon-milk topping can elevate these muffins to new heights. 30 mins. to 37 mins. *Or substitute 1 tablespoon lemon juice for 4 teaspoons of the milk. Preheat the oven to 400°F. Lightly grease (or line with muffin papers) the wells of a 12-cup muffin pan. To make the muffins: Whisk together the flour, sugar, cornmeal, juice powder or zest, poppy seeds, baking powder, and salt. Set aside. Whisk together the milk, eggs, butter, and extracts. Add the wet ingredients to the dry, stirring until everything is evenly moistened. Divide the batter among the prepared muffin cups, filling them almost full. 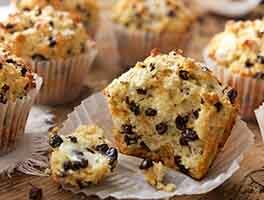 Bake the muffins for 18 to 20 minutes, until a cake tester or toothpick inserted in the center of a muffin comes out clean. 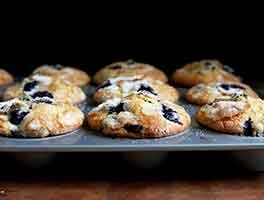 Remove the muffins from the oven, and after 5 minutes transfer them from the pan to a rack. To make the glaze: Stir all the ingredients together, adding more milk or sugar if necessary to make the glaze spreadable. Spread the glaze atop each warm muffin. Allow to set before serving. If you'd like a slightly subtler lemon flavor, or if you don't have lemon juice powder, substitute 1/4 cup (2 ounces) freshly squeezed lemon juice for 1/4 cup of the milk; the batter may curdle, which is OK.
To make lemon poppy seed bread: Preheat the oven to 350°F. Prepare the batter as directed, and spoon it into a greased 8 1/2" x 4 1/2" loaf pan. Bake the bread for 45 to 55 minutes, until a toothpick or cake tester inserted into the center comes out clean. Remove the loaf from the oven, wait 10 minutes, and transfer it from the pan to a rack to cool completely. I used fresh lemon juice and zest but omitted the vanilla. The muffins were delicious, a wonderful fruity lemon taste. 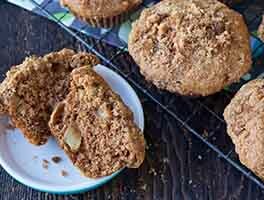 The cornmeal is a great addition to the muffin. I liked the texture because the muffin wasn't gummy. I want to make them with the lemon juice powder to compare results. They get four paw approval from my Australian Shepherd, Gatsby! I made the muffins exactly as written. I halved the glaze recipe, but used the full amount of lemon juice powder. I left one muffin unglazed, to see what it was like, and I personally think that without the glaze, there is not much lemon flavor. When I make these again, I will perhaps use lemon juice, more lemon extract, or lemon zest as well. I think spread the glaze with an icing spatula, and I think that half the glaze called for was plenty for me! I do love the addition of the cornmeal! The cornmeal I used was medium ground, not fine, and I think next time I will try this with fine ground, just to see the difference. I made these with the 1/4 c lemon juice and a tablespoon limoncello because I didn't have extract. The other change that I made was use 2 oz butter and 2 oz apple sauce. The next time I would use all butter. They only baked 16 mins and could have come out a minute sooner. If the had been in 18 mins, they would have been dry. ( I weigh my ingredients) they were very good but needed the fat from full stick of butter. Lovely muffins. I use the zest and juice of one whole lemon. Replace the milk with buttermilk. Makes for tangy, lemony, delicious, moist muffins. 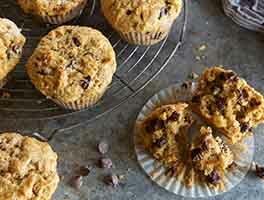 I made this recipe exactly as written & while the flavor was good, the muffins were very dry. So the next time I made them I looked up a blueberry muffin recipe that I've always had good luch with & just substituted lemon for the blueberries. I made them again today & added 1 tbsp lemon zest as well as the lemon powder & oil & that really made a difference. I even added some lemon flavored sugar on top while they were baking, but it didn't really add to the flavor & it burned the tops of the muffins. I won't be trying that again! I would give it five stars but I had to tweak it. No lemon powder as so many others said. So I added a full 1/4 teaspoon of lemon oil and a few extra drops of lemon extract to the batter. Noticed the batter was a bit drier than other muffins I made today so I added both milk and oil, about 2 T each. Perfect. Moist. Great lemon flavor. I made the glaze using lemon juice and it is great also. Since I have trouble with hand eye coordination, I will say my 3 year old grandson did the glazing but I don't think anyone will mind as the muffins are delicious, and like you said, the glaze really does raise the bar. Thanks for another keeper. I made these and they were good. I didn't have lemon juice powder, so used the suggested substitution. I do wish the lemon flavor had been stronger, but I will make again. I'd like to make this into a loaf instead of muffins. Can KAF post baking directions to make this into a loaf? Size and time in oven? Would that work? WONDERFUL!! So flavorful. These will be on my rotation. I used tulip paper liners...which were perfect size. Subbed 1/4 tsp. lemon oil in the glaze since I had no lemon extract. Baked 18 min. Turned out moist and totally delicious. These are outstanding. I used the lemon powder. I had no lemon extract, so I used 1/4 t lemon oil. Honestly, the best lemon poppy seed muffins we've ver had.